Ahoy Matey! Your kids will go overboard for the awesome Adventure Galley water slide. This bright, colorful water slide is designed to resemble a pirate ship. The platform is encased in mesh for safety and has a red and white striped cover featuring a pirate skull and crossbones! 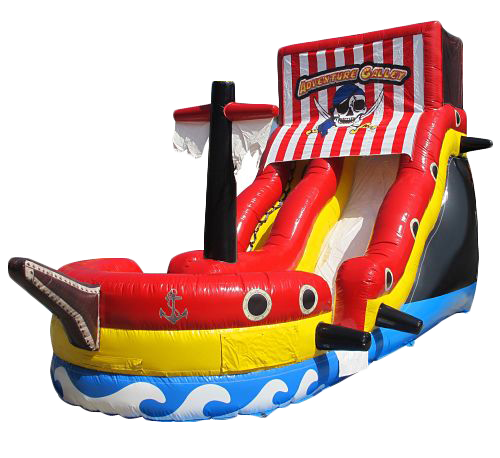 So get all your shipmates on board for a high-seas high-fun adventure with the Pirate Ship Inflatable Water Slide. When you rent this water slide, YOU MUST PROVIDE A HOSE LONG ENOUGH TO REACH WHERE THE INFLATABLE IS GOING TO BE SET UP. Go ahead, see a video of this amazing Pirate water Slide.